This month's newsletter has a focus on twin language development and the "special" language that some twins seem to share. Many parents will find themselves dealing with twins who are behind in their speech, so having some basic information can be very helpful in understanding just what you may be in for, or if you already have twins, what you can do to help. We will also cover some interesting information on autism, recognizing it's symptoms, and how it may relate to language development. 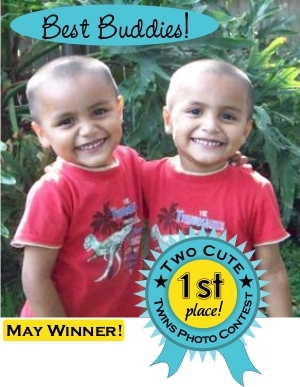 Don't forget to check out the May "Two Cute" contest winner and our "Featured Mom", Stephanie Manner Wagner. We're offering a fun new contest too! Twin language or twin speech is often referred to as autonomous language, cryptophasia, or idioglossia. They are all types of communication systems, most commonly occurring in twins. With the exception of Cryptophasia, they may also transpire between singletons and between other siblings of multiple births. Basically, this phenomenon of twin language describes the way two or more close siblings use words and/or gestures that are largely unrecognizable or even completely unintelligible to others. This is not necessarily a rare occurrence, but more of a misunderstood one that has fascinated parents of twins and the general public for years. However, new studies may shed some light on this intriguing subject. Well, in reality it's very rare that twins develop a genuine "language". More commonly, twin language consists of one twin modeling the undeveloped or muddled speech pattern of their co-twin. This then results in the flawed use of speech sounds and grammar by both twins which may then give the perception of a "secret language". This also seems to be intensified amongst identical twins. Hence, the word Cryptophasia, which specifically describes the unique occurrence of language developed by identical twins. It should also be noted that circumstance plays a role in twin speech development. Some studies imply that premature twins or twins with low birth weight may have a higher incidence of delayed speech and/or idioglossia. And most health care professionals agree that boys (twins or not) tend to speak a bit later than girls. Then, of course, you have to factor in the language of the parents or guardian having the most interaction with young twins. If this "model language" is absent or lacking, twins tend to use each other as a model which leads to the inaccurate use of grammar as mentioned earlier. One mother of twins was told most accurately by the pediatrician, "Your twins already have three strikes against them in terms of speech development. They were preemie, they are boys, and they are identical"! Taking the time to read to twins regularly can play an important role in their language development, as studies have indicated this. Creating a language-rich atmosphere, such as talking about what you are doing while doing it, may help twins associate words with actions. The use of "baby talk" should be avoided for obvious reasons. Instead, when a word is pronounced incorrectly, try repeating it back the correct way while emphasizing each syllable. Always encourage twins to use actual words rather than gestures or sounds to tell you something. For instance, if they gesture or grunt for more juice, try asking, "Do you want more juice?" before just handing it over. Play time with twins is another great opportunity to help them with speech by naming each toy, color, or shape. Lastly, if you ever have concerns regarding your twins speech development, contact your pediatrician or a speech-language pathologist for help and guidance. Autism is a neurobiological disorder which affects a child's ability to communicate and effectively engage in social interaction. This year, more children were diagnosed with autism than with diabetes, cancer, and AIDS combined. While there is no cure for autism, children with autism have great potential for improvement with early intervention. Therefore, it's important that parents are aware of some of the early signs that may signify an autistic spectrum disorder. • No big smiles or other warm, joyful expressions by 6 months of age. • No back-and-forth sharing of sounds, smiles, or other facial expressions by 9 months. • No response when the child's name is called by 10 months. • No back-and-forth gestures such as pointing, showing, reaching, or waving by 12 months. • No two word meaningful phrases (without imitation or repeating) by 24 months. • Any loss of speech, babbling, or social skills at any age. If your child exhibits any of the above behaviors, it doesn't necessarily mean that he/she has autism. However, you'll want to bring your concerns to the attention of your pediatrician or a developmental specialist for further evaluation. "With the recent media attention, many parents are nervous about the possibility of autism. Are multiples more likely to be on the spectrum than singletons"? Here's May's winner! They truly look like "best buddies"! Entering is totally free and the winner will receive a brand new copy of In The Womb - Multiples DVD as seen on National Geographic Channel! I decided to create my blog when pregnant with my now 11 month old twins. The inspiration was that I was having a very hard time finding product reviews made specifically by mommies of twins. I wanted to be able to go to one blog and hear thoughts from a real life twins mom. I wanted her to tell me what she thought of the certain diaper bags, strollers, high chairs, and such. While I had 3 children already, I knew that the needs and expectations for a twin mommy were going to differ sometimes. Since I never found that place, I made it myself. I love feeling like I am helping other parents out. I have fun sharing new finds and experiences with other parents. Additionally, I love reading all their comments on their own experiences on topics and products I have covered. It's a wonderful way to make new friends and hear new perspectives. I was recently one of 10 elite bloggers chosen to work on a special Hershey's Night at the Museum Movie tie-in promotions. I credit being selected with not only the quick success with my blog and my writing style, but also companies growing interest in appealing to the vastly growing multiples market. I am a married Mommy of 5. My oldest son, J.C. just graduated from 8th grade this year and is off to high school in the fall. He's an amazing boy, here is a link to a recent post on JC. My next oldest is my son, Hayden, who is 10. He was the middle child for a very long time around our family and had some adjusting to do when we added the twins to our family. Here's a link to his reaction to the news we were having twins. My 3rd child is our only daughter, Cordelia who is 8. She was the baby for 7 years and will always be the princess of our household. She is a fabulous "sissy-mom" to the twins and does a great job of keeping her older brother's in line as well. 4 & 5 are our fraternal boy twins, Cormac & Declan (or Mac & Dec for short). They are amazingly little guys who keep the whole house busy and entertained. It is hard to even remember what life was like before these 2 entered our world. Each of them has wide different personalities and talents, yet they are equally adored. My husband and I feel the twins arriving last has been a real blessing. While the plan was to have just one more, and we probably would not have knowingly signed up for twins with 3 kids already, it has worked out so well to have all the extra help. I'd like to think I give it daily via my blog.